This hotel is suitably located to enjoy the pool, beach and the local resort all within a stone's throw away. The sandy beach doubles up from a relaxing haven to an active match of volleyball and if reading a book by the pool matches your style then you will find plenty of pool space to pull up a sun lounger. In terms of food you can really indulge with a choice of restaurants able to tempt any pallet. It can be difficult to drag yourself away from your room, as the homely feel comes as standard and take our personal recommendation and make the most of its beachfront location by adding a sea view to your choice. Everything you would want from your own living space with a light and fresh feel about them. Double rooms are with balcony or terrace and have an inland view. Sleeping up to 3 people they come complete with mini fridge, LCD TV and air conditioning. These rooms are larger than our double rooms and can sleep up to 4 people. There's a double or twin bed and comfortable bunk beds to maximise your space. They come with a balcony or a terrace with an inland view and come complete with mini fridge, LCD TV and air conditioning. Family rooms are perfect for practical space and privacy with two separate rooms with a connecting door. 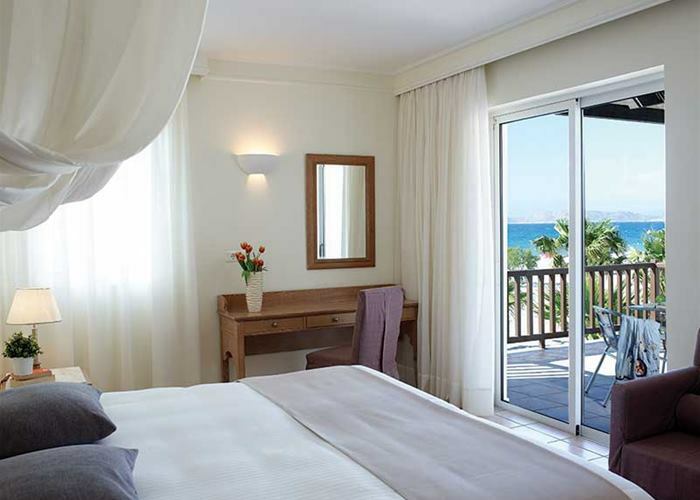 There's a double or twin beds as well as two singles or two sofa beds and have a balcony or terrace with an inland view. 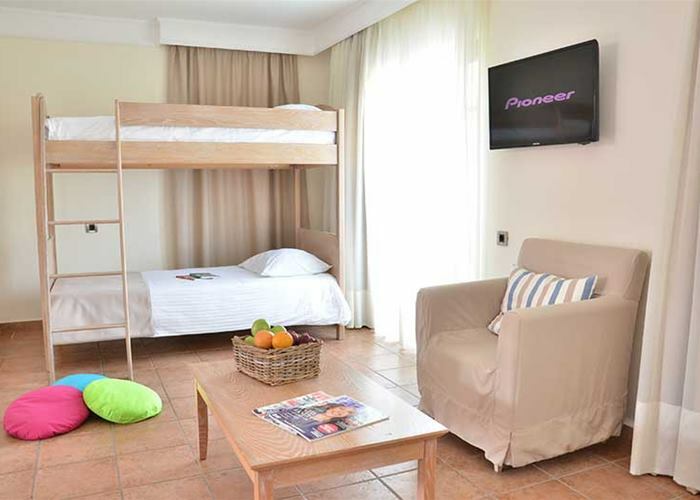 Rooms sleep up to 4 people and come complete with mini fridge, LCD TV and air conditioning. When space is just as important as privacy when you're travelling as a family this suite will tick all the boxes. 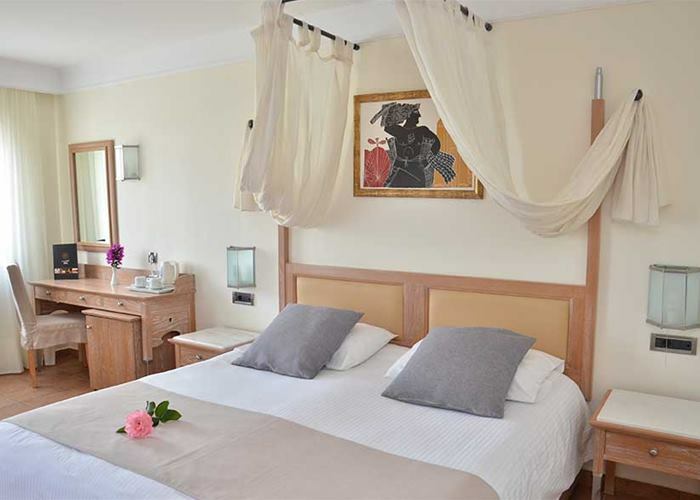 There's a bedroom with a double or twin beds and a lounge separated with a closing door that doubles up in to a sleeping area with an additional 2 sofa beds allowing up to 4 people to sleep in this suite. You'll find the essentials like mini fridge, LCD TV and air conditioning. Available to book with inland or limited sea view. 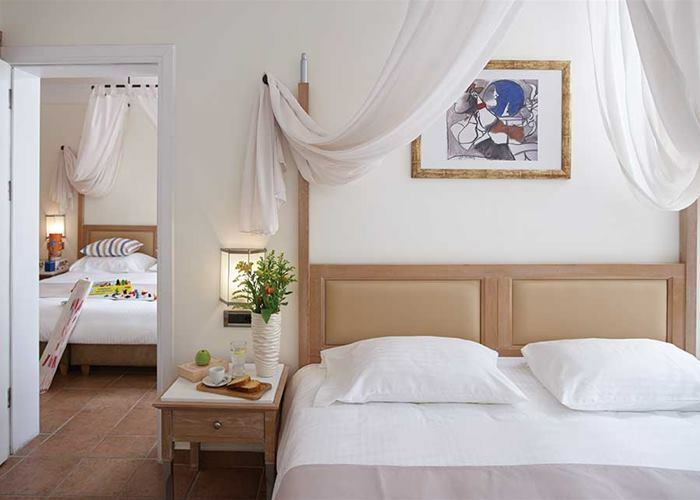 These suites have got plenty of clean cut lines and the white washed walls give a real cool feeling perfect for the Mediterranean climate. Space is endless with two large bedrooms with double or twin beds and a comfortable lounge area with two sofa beds. 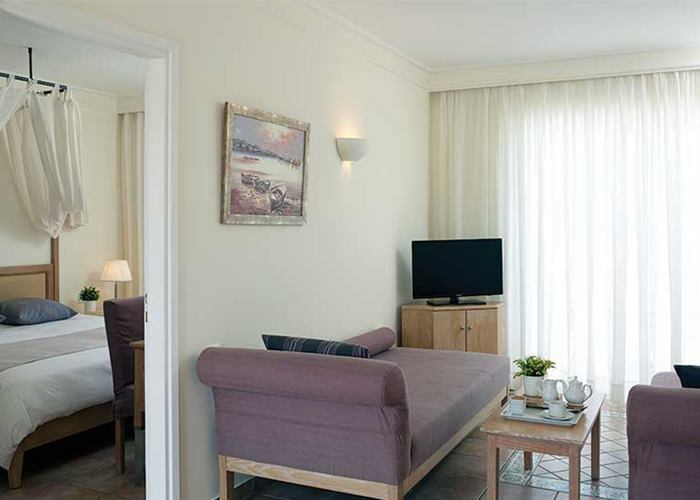 Suites sleep up to 4 people and come complete with the essentials like mini fridge, LCD TV and air conditioning. Available to book with inland or limited sea view.